Arizona Sonora Desert Museum is the place to get a first hand look at wildlife in the Sonora Desert. Visitors may take one of the many daily tours or just wander around on the paths and trails. Please understand there are over 2 miles of paths on the 21 acre museum grounds. Once on the paths, you will be out in the sun so plan accordingly and be sure to wear comfortable shoes. 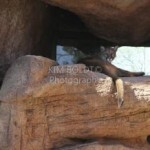 At the Arizona Sonora Desert Museum there are many things to see. A desert zoo, natural history museum and botanical garden are on the grounds and centrally located. Seeing the desert wildlife in their natural habitat is quite exciting. Expect to see a variety of small desert “things” at the Arizona Sonora Desert Museum. Javelina, Wolves, Coyotes, Mountain Lions, Prairie Dogs and Gila Monsters. Oh, Yes – the snakes that are found in the the desert around Tucson. A 1/2 day or more is needed to take in all of the Arizona Sonora Desert Museum is a great day trip and fun for the whole family whether you are living in Tucson or just visiting. Other popular Tucson Attractions include Kitt Peak about 50 miles Southwest of Tucson, Old Tucson Studios West of Tucson and the Pima Air & Space Museum & San Xavier del Bac Mission on the South Side of Tucson.